1. 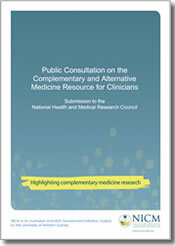 Talking with your Patients about Complementary Medicine - a Resource for Clinicians (opens in a new window) provides a pdf document with information on CAM use and regulation in Australia. It also includes prompts for having a conversation with a patient on considering evidence, effectiveness and potential risks of CAM use. 2. Time to Talk - Ask Your Patients About Their Use of Complementary Health Practices (opens in a new window) This page provides information to assist clinicians in discussing CAM use with their patients and provides access to a free toolkit.